Welcome to White Ballers Week: White NBA players often get mocked, and why would The Bust take the high road and do anything different? 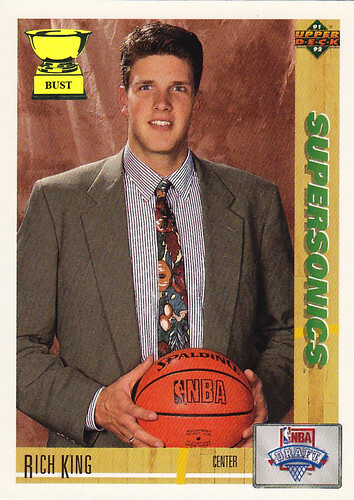 In honor of the all-star game, for seven long, long days, we'll bring you some of the most awkward white guys to wear an NBA uniform — or a barf-inducing suit — in the early 1990s. Enjoy. Fit for a King: What a name. What a guy. Rich King is the epitome of the early 1990s white baller. He was a star at the University of Nebraska but ended his career with more serious injuries than points per game. If he weren't 7 feet 2, you'd expect him to be a competitive "Donkey Kong" player or a huge fan of prime numbers. He owned a suit your father wouldn't be buried in; it's probably for sale at Goodwill right now for $14.99. This guy's name is "Rich King" for the love of god. It doesn't get more elitist than that. Rich King: what a white baller.